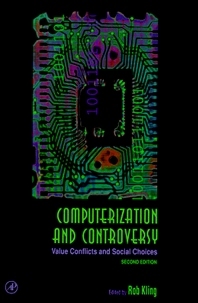 The Second Edition of Computerization and Controversy: Value Conflicts and Social Choices is a collection of 78 articles that examine the social aspects of computerization from a variety of perspectives, many presenting important viewpoints not often discussed in the conventional literature. A number of paired articles comprise thought-provoking head-on debate. Fields represented include computer science, information systems, management, journalism, psychology, law, library science, and sociology. This volume introduces some of the major controversies surrounding the computerization of society and helps readers recognize the social processes that drive and shape computerization. Division into eight provocatively titled sections facilitates course planning for classroom or seminar use. A lead article for each section frames the major controversies, locates the selections within the debates, and points to other relevant literature. Includes discussion of the following issues related to computerization: @subbul:* Does computerization demonstrably improve the productivity of organizations? Should computer systems be designed to empower workers? Does electronic mail facilitate the formation of new communities, or does it undermine intimate interaction? Is computerization likely to reduce privacy and personal freedom? Researchers, scholars, graduate students, and professionals in computer science, library science, sociology, business, and business management--particularly those concerned with the social and ethical implications of computersin society. Also of interest to philosophers, psychologists, and laypersons having similar interests and concerns. For approximately two decades, Rob Kling has written extensively about the interface between computerization and real society and culture. The emphasis here is on the impact of computerization on organizations (especially corporations) , rather than on individuals within a society as a whole. The eight parts of this book provide a general overview of mental models, technological utopianism and dystopianism, economic and organizational dimensions, the work environment, social and personal relationships, privacy and social control, safety and vulnerability, and ethical perspectives and professional responsibilities. Each introduction concludes with a very useful list of the sources where the anthologized chapters can be found along with a list of references for other publications cited in Kling's introductions and items for further reading. It seems to be written primarily for an undergraduate readership, but could teach and delight graduate students, teachers, information professionals, and the common reader.